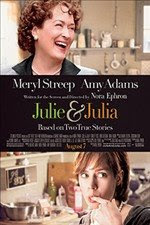 Tonight my daughter and I went to see Julie & Julia. First of all I absolutely loved the movie. Meryl Streep, Amy Adams and Stanley Tucci were wonderful in their roles. A must see movie, especially for foodies! As I sat watching the movie I thought back to how I became passionate about cooking. Without question it started when I was a little girl sitting around the kitchen table and stove helping my grandmother cook. She lived with us. I continued my passion for cooking when I got my first apartment, junior year in college, and would cook for my roommates and friends on the floor. The one dish I recall most was the Crabmeat Quiche I prepared from a recipe out of Bon Appetit. It was incredible even though the stove caught fire. Lucky for me we had plenty of flour to drown out the flames. However, it wasn’t until years later when I was a stay at home mom that my passion for cooking actually grew out of necessity. For those of you reading this, who may also be stay at home moms or were, I’m sure you can relate. Let me explain…. After graduating college and eventually getting married I had a full time job. Each day I would get a pat on the back for something I did well or for the way I looked or dressed. When you stay at home all day with the children (a job I wouldn’t have traded for the world) you just don’t typically get those rewards on a regular basis. Now that my children are grown, I’m reaping them big time. I can see what a terrific job my husband and I did raising them. Back then though, when I would cook a great meal whether it be for my own family, friends or relatives and I’d get a pat on the back, it just encouraged me more. It made me that much more passionate about my cooking. I found that I wanted my next meal to be even more spectacular. I would try new things daily and rummage through 100s of cookbooks that I collected over the years. I found myself being creative, adventurous and stepping out of my comfort zone trying all things wrapped. Wellingtons, foods wrapped in phyllo dough, exotic sauces, you name it I tried it. With each new dish I was rewarded over and over again. Which brings me to where I am today. I taught myself most of what I know and still continue to soak up everything I read or watch when it comes to cooking. I know I wasn’t always a great cook but I have always enjoyed the creative aspect of it. It’s like being an artist. I suppose that’s why I feel so strongly about teaching others to cook. If I could do it, I know others can. For some it just takes learning how to understand what you’re reading and following the directions. Once you master that skill the rest becomes easy. Julie & Julia reminded me of how I got where I am today with cooking, and I know I’m not alone. So I’m curious. Obviously I became more involved with cooking as a means of keeping myself busy and reaping rewards for the wonderful dishes that I prepared for others. What made you so passionate about cooking or if not cooking what has your outlet been? hmm, unfortunately, I’ve grown to hate cooking to be honest. I use to love cooking new dishes and hearing the compliments. Being a single mom can be tough at times, you get so wrapped up in everthing else there is to do, cooking seems like such a chore now. I do envy creative people like yourself and my cousin who is a chef, I love seeing the finished products and how you whip it together to effortlessly. Thanks for your comments. However, I think we all eventually gravitate to something. For you it’s the jewels you make. I’ve seen your website and they are stunning pieces. I would bet that when your home is quiet, that’s when you pull out the beads and start creating. Would I be wrong to say it’s a great release for you and the rewards are seeing what you’ve created and then being validated by it when someone makes a comment about a piece or purchases it? For me my outlet and passion became cooking for you it’s jewelry design and you’re great at it! I used to love to cook, before my husband and I had children. We both cooked and we liked to try new things. Then we had children – who wouldn’t eat this, wouldn’t eat that – no “pats on the back” for me from cooking! They only wanted the plain basics, even though we would try to expose them to other foods. PS – now that they are grown, my children are both more adventurous with food. As a matter of fact, my son spent a semester in SE Asia last year – and ate some things I wouldn’t even want to be in the same room with!